Oh look a Vancouver Realtor telling you to sell your home. I’ll bet you’ve heard that one before? Except this time it’s different and it’s very real. If you were ever thinking about cashing out of Vancouver real estate now is the time. First off, this is not a sales post. When I tell you to sell I mean just sell. I don’t care who you use, i’m sure there’s someone capable of doing it amongst the 13,232 Realtors in REBGV. If you want to use me, great, you can do that here. Look I’ve been following the trends for some time now. As I mentioned yesterday October sales Off to Slow Start. There is no immediate turnaround coming for Vancouver real estate. The next few months coming up, the winter months, are historically very slow. That will likely only fuel a continued slowdown in the market. So your options are to cash out now and still have a chance to walk away with some massive profits or take a gamble, roll the dice, and hope for a turnaround in the Spring. Look prices could very well turnaround in the Spring. But is that a gamble worth taking? Again, I’m only speaking to the people who have actually been humming and hah’ing contemplating when to pull the trigger. Vancouver has had an incredible run. Prices have grown 250% since 2002. Is this kind of growth sustainable forever? Don’t get me wrong Vancouver prices will always be high. But to expect this rate of growth to continue is extremely unlikely. According to The Globe & Mail, at this rate house prices in Vancouver will be 80 million by 2040. These kinds of returns make Warren Buffett look like an amateur. But why listen to me I’m just a Realtor. Take advice from wealthy, millionaire investors. They’ve made fortunes on understanding trends and predicting things nobody else could. Kevin O’leary says housing market will end badly. 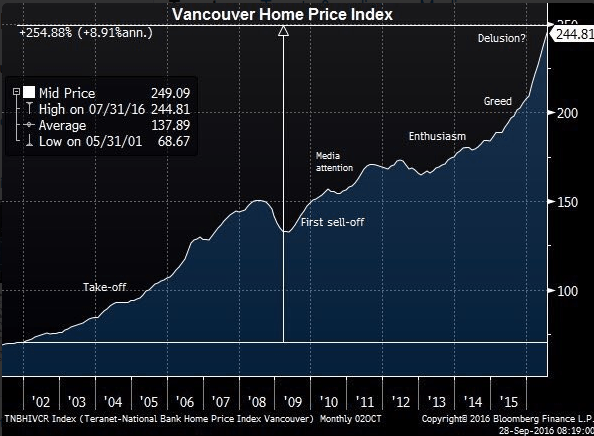 Billion dollar fund manager betting against Vancouver housing market. With interest rates at all time lows and debt levels at record highs our economy is in unknown territory. As famed real estate investor Robert Kiyosaki recently said “we’ve never been here before in history. The fed is out of ammo.” Kiyosaki was referring to the low interest rates used by the fed to stimulate the economy which has naturally inflated asset prices (houses). Vancouver real estate prices dodged a bullet in 2008. While many global economies took a massive hit due to the financial crisis in the United States, Vancouver real estate prices miraculously only dropped 9% from January 2008-January 2009. Meanwhile, prices are down 19% this year from January to September. The biggest drop recorded in Vancouver history. Bank of Canada calls real estate overvalued back in 2015. This blog has been providing evidence for months of a housing correction. It’s real and it’s likely just beginning. Even foreign buyers from China have been warned. 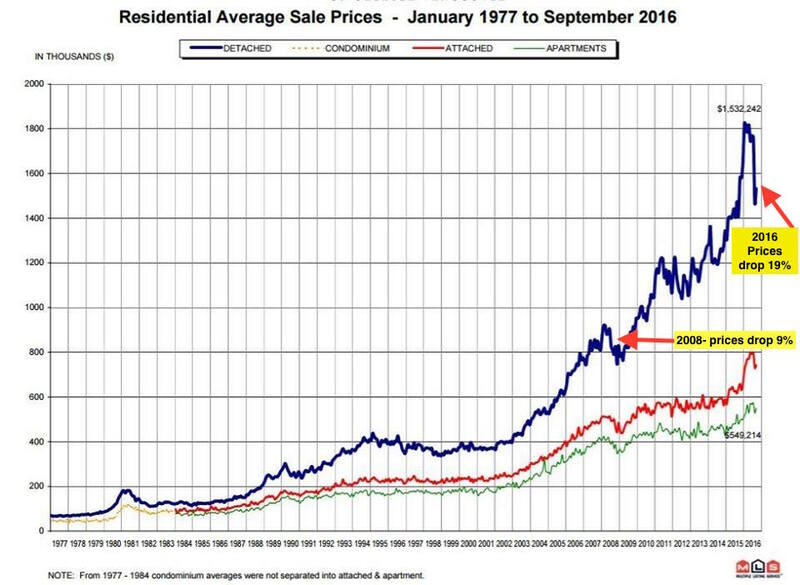 Although Vancouver prices will surely rebound again, i’m not so optimistic it will happen anytime soon. With upcoming provincial elections and an impending fed rate hike- if you were ever considering selling and locking in your profits, the time is now.